B&J is the U.S. and Canadian distributor for Falcon skocks. We build and custom valve your new shocks to your application, rider style and weight! 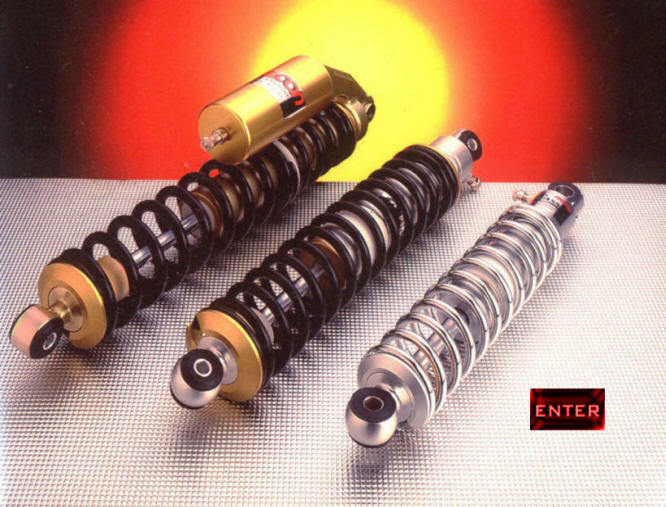 Call us today to get your shocks! The range or Falcon shock Absorbers for Motocross bikes or this era have been built to include and update many of the features that became necessary when long travel suspension was introduced. The dampers have been designed with a large bore (36mm). The bodies hold more oil and run cooler over long periods than the 32mm, bore shocks, and the range of spring rate on the dual spring set up enables the rider to fine tune the springs, so as to obtain exactly the right 'feel' to the suspension. Two types of damper are available in this range. A straight damper with the gas reservoir inside the top of the body, or the 'piggy-back' style, with the gas reservoir on the side of the shock body, as part of the mounting bracket. This style of shock not only holds twice the oil volume as the straight shock, but as the reservoir is away from the damper body, better heat dissipation is obtained, resulting in a cooler running unit with more constant damping characteristics. These types of shocks are available in lengths from 376mm - 445mm centres. mechanical parts as our motocross range, so that strength and durability are not in question. We can supply units with our standard damping system, or, at a small extra cost, we can install our super light system for riders who prefer their suspension to work more like a modern monoshock trials bike. Damper lengths supplied from stock vary from 11" in. (280 mm). to 16.9 in. (429 mm). centres, in steps of 1/4 in. (6 mm), or less in some cases. The units are based on the 32 mm. bore steel construction, and most popular sizes are also available in lightweight aluminium. The weight saving on the aluminium shock absorbers is nearly 1.5lb. over the steel construction units. Steel shocks are finished in satin black, with the all aluminium units in clear anodising. Both types use chrome plated or satin black powder coated springs. All our trials shock absorbers are designed to fit onto the motorcycle with the damper body at the top. If however you require your shocks to run body downwards, this can be arranged at a little extra cost.